Google Has Much More To Tell Us About Video Games Now. Maybe Too Much. You know that neat little box that pops up on the right when you search Google for movies or books and such? 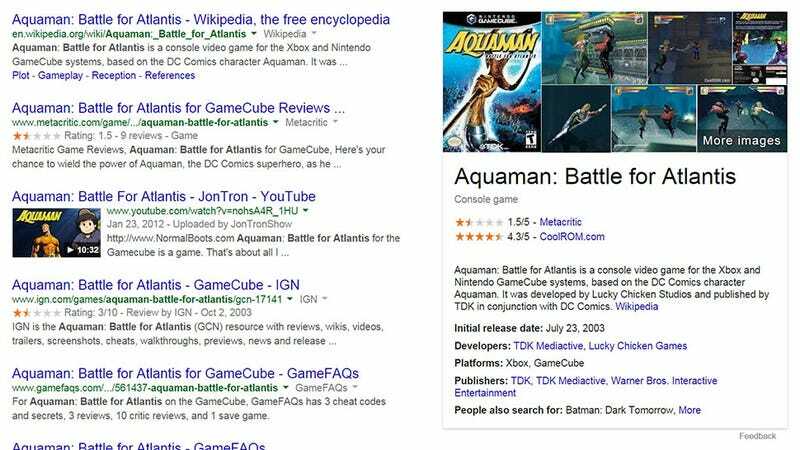 Now it does that for video games as well, thanks to an update to Google's Knowledge Graph. As you can see in the image above, no video game is safe from Google's database. With a simple search we can see Aquaman's Metacritic score. Below that, there's a rating from a website where an ISO for the game can be downloaded, which seems like a bad idea. Not every game gets a link to that particular site — the results vary by game. Newer titles will link to Steam or Gamestop reviews, while mobile games will link to iTunes or Google Play. But quite a few older titles I've searched for have that particular site in the info box. Questionable links aside, the new result box is quite nifty. I love the synopsis, the quick access to release date, publisher and developer info, and the "People also search for" deal at the bottom is perfect for a lazy day of game research.